Sunday's seven-game schedule was headlined by a matchup between the teams with best records in their respective conferences (Toronto and Denver), but it was a player on a team that currently has a losing record that stole the show. Wizards point guard John Wall put forth the best effort of his season to date as Washington beat the Lakers, with Bradley Beal and Sam Dekker also performing well. Below is a look at some of Sunday's highlights, with Wall's effort leading things off. Follow Raphielle on Twitter here. With a 12-18 record on the season, it's safe to say that things have not gone as planned for the Washington Wizards thus far. There's been controversy and more recently change, with the team acquiring veteran Trevor Ariza in exchange for Austin Rivers and Kelly Oubre Jr. with the hope being that his presence will spark positive change in the locker room. Ariza could very well have that impact, but the Wizards' hopes ultimately rest upon the shoulders of John Wall and Bradley Beal. And in Washington's 128-110 win over the Los Angeles Lakers Sunday night, Wall put forth his best performance of the season to date. Wall reached the 40-point mark for the first time this season, shooting 16-of-27 from the field with 14 assists, six rebounds, three steals, two blocked shots and four 3-pointers (on eight attempts) in 42 minutes. 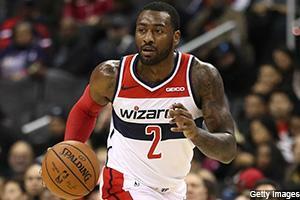 Wall, who last scored 40 points or more in a game on April 28, 2017 in a series-clinching win over Atlanta, had to deal with a heel injury earlier this month but he certainly looked full strength against the Lakers. Wall certainly had his issues with the Lakers last season, averaging 20.5 points, 7.0 rebounds, 5.5 assists, 1.5 steals, 1.5 blocks and 0.5 3-pointers per game. While the scoring average was slightly higher than the mark he posted for the entire season (19.4 ppg ), Wall shot just 37.5% from the field and 14.3% from three in those two games. He had no such issues Sunday, regardless of who the Lakers sent his way, with the Wizards ending their four-game losing streak as a result. Also performing well for the Wizards were Beal, Jeff Green and Sam Dekker, with the former scoring 25 points (10-of-24 FG, 1-of-1 FT) with 12 rebounds, three assists and four 3-pointers on nine attempts. Green tallied 20 points (8-of-15 FG) while also grabbing seven rebounds and making four 3-pointers. The surprise was Dekker, who scored a season-high 20 points on 10-of-15 shooting with five rebounds, four assists and three steals. The Wisconsin product, who arrived in Washington just over a week ago via the three-team trade that sent George Hill and Jason Smith to Milwaukee, saw action due to the fact that Oubre and Rivers are gone and Ariza has yet to suit up. Give Dekker credit for making the most of his opportunity, and maybe he's give Scott Brooks something to think about with regards to the rotation moving forward. But it's difficult to see him being a viable fantasy option until he shows himself to be a consistent contributor for the Wizards. One night after he and Lonzo Ball became the first Lakers teammates to tally triple-doubles in the same game since Kareem Abdul-Jabbar and Magic Johnson pulled off the feat in 1982, LeBron James had a tough time getting going against the Wizards. By game's end James managed to score a season-low 13 points on 5-of-16 shooting from the field to go along with six rebounds, three assists, one blocked shot and four turnovers. This is the fourth game this season in which LeBron has failed to score at least 20 points, with the most recent coming in a November 27 loss to the Nuggets (14 points). What did James do the following game? 38 points, nine rebounds, seven assists, two steals and two 3-pointers in a win over the Pacers. The Lakers pay the Nets a visit Tuesday night. In a matchup of franchises in the midst of rebuilding projects, the Nets rolled past the Hawks by the final score of 144-127 ( the second-highest single-game point total in franchise history). Eight Nets players finished the game in double figures, and D'Angelo Russell led the way with 32 points (13-of-19 FG, 1-of-1 FT), seven assists, six rebounds, five 3-pointers (on nine attempts) and no turnovers. While he is in the midst of the best season of his four-year NBA career, Russell entered Sunday's game in a bit of a slump. In the three games prior he averaged 9.7 points, 9.0 assists, 1.7 rebounds and 1.3 three-pointers per game, shooting 33.3% from the field and 36.7% from beyond the arc. It's safe to say that the Nets' starting point guard, who has now scored 30 points or more in four games this season, has snapped out of that funk. Sunday's game wasn't a pretty one for the Hawks defensively, but in the defeat center Dewayne Dedmon produced his best effort of the season. The USC product scored a season-high 24 points (8-of-12 FG, 3-of-4 FT) while also accounting for 12 rebounds, three assists, one steal, one blocked shot and a career-best five 3-pointers on five attempts. How out of the ordinary was Dedmon's three-point shooting? In the nine games prior he made a total of five three-pointers on 22 attempts. And this is also the first game of the season in which he's made multiple three-pointers. Dedmon certainly has the green light to take these shots but as a 24.5% shooter from three on the season, Sunday's showing is more of an anomaly rather than the norm for the big man. In the 76ers' 128-105 win over the Cavaliers, Ben Simmons racked up 22 points (9-of-15 FG, 4-of-5 FT), 14 assists, 11 rebounds, one steal and no turnovers. The triple-double is Simmons' first since October 24 against Milwaukee and the 15th of his career, and the turnover count is the eye-catcher here. Simmons, who had his triple-double before the third quarter was completed, became just the fourth player in NBA history to have a line of at least 22 points, 14 assists and 11 rebounds without committing a turnover. To say the least this was a big day for the point guard, with Joel Embiid adding 24 points, nine rebounds, two assists and one blocked shot and to lead the Sixers past Cleveland. Jimmy Butler finished with 19 points, two rebounds, two assists, one steal and one blocked shot in his return to the lineup after missing the prior two games with a groin injury. After two relatively quiet (by his standards) games after a lengthy absence due to knee trouble, the Pacers guard appeared to be his old self during Sunday's 110-99 win over the Knicks. Oladipo scored 26 points, shooting 7-of-13 from the field and 7-of-8 from the foul line, while also racking up eight rebounds, seven assists, five steals and five 3-pointers (on eight attempts). In the two games prior Oladipo scored a total of 26 points, shooting a combined 10-of-27 from the field. His absence from the lineup, a crippling blow to last year's Pacers when this occurred, was anything but for the 2018-19 edition. Others stepped forward during Oladipo's time on the sideline, including Domantas Sabonis off the bench and starters Bojan Bogdanovic and Thaddeus Young. And in Sunday's win Myles Turner supplemented Oladipo's performance with a 24-point, six-rebound, two-block effort of his own. All five Philadelphia starters scored in double figures Sunday, and they received a boost off the bench from rookie guard Landry Shamet. The Wichita State product shot 6-of-7 from the field (4-of-5 from three) to go along with two rebounds and one blocked shot, and he did all of this in 15 minutes of action. Over the last five games he's averaging 9.2 points, 2.4 rebounds and 2.4 three-pointers per game, shooting 51.7% from the field and 12-of-25 from beyond the arc. Josh Richardson entered Sunday's game against New Orleans on a bit of a cold streak, as in his six games prior he was averaging 11.5 points, 4.7 assists, 3.3 rebounds and 1.8 three-pointers per game. And during that stretch, the Tennessee product was shooting just 29.5% from the field and 31.4% from three. Richardson turned things around in the 102-96 win over the Pelicans, scoring 22 points (9-of-20 FG, 2-of-2 FT) with four assists, three steals, one rebound and two 3-pointers. While the game wasn't perfect for him, as he turned the ball over four times and shot 2-of-8 from deep, Richardson managed to shoot at least 45% from the field in a game for the first time since November 23 against Chicago. His usage has increased substantially from last season to this, jumping from 18.2 to 23.5, and the overall field goal percentage has dipped (40.4% after shooting 45.1% last season). The question to ask now is whether or not Sunday's outing serves as a catalyst of sorts for Richardson as the Heat look to fight their way up the Eastern Conference standings. Anthony Davis and Heat center Hassan Whiteside produced one of the better individual matchups Sunday, with both posting double-doubles in the Heat's six-point win in New Orleans. Davis tallied 27 points (10-of-19 FG, 5-of-6 FT) with 12 rebounds, seven assists, three steals, three blocked shots and two 3-pointers, with Whiteside countering with a 17-point, 12-rebound, three-block effort. Davis is now up to 19 double-doubles in 27 games played this season, and at this rate he could very well surpass the 50 double-doubles he tallied a season ago. Jrue Holiday added 22 points, four assists, three steals, two rebounds, one blocked shot and four 3-pointers for the Pelicans, with Julius Randle scoring 17 points and grabbing ten boards for his 16th double-double of the season. Sacramento has been one of the NBA's pleasant surprises thus far, and the play of the team's backcourt is one reason why. In Sunday's 120-113 win over the Mavericks in Dallas the Kings' starting guards combined to score 71 points, with De'Aaron Fox and Buddy Hield scoring 28 apiece and Bogdan Bogdanovic adding 15. Fox, who shot 11-of-19 from the field and 6-of-6 from the foul line, added five assists, three rebounds, three steals and one blocked shot in 33 minutes played and in a few instances was a one-man fast break. The second-year point guard has scored 25 points or more in four of his last six games, a stretch in which he's averaging 23.2 points, 7.7 assists, 3.5 rebounds, 2.3 steals and 1.7 three-pointers per contest. He's shot the ball well during this run as well, making 55.9% of his shots from the field and 43.5% from beyond the arc. As for Hield, he made 12 of his 23 shot attempts Sunday night (3-of-9 3-pointers) and also contributed four rebounds and two assists. The Oklahoma product has now scored 20 points or more in six of his last seven games (his second stretch of six 20-point games in seven the season), and over the Kings' last five he's averaging 21.8 points, 3.6 rebounds, 2.2 assists and 4.2 3-pointers per game. Mavericks rookie Luka Doncic has been, in the eyes of many, the best rookie to this point in the season. His ability to create for himself and others has been one of the key factors in the Mavericks' play this season, and in Sunday's loss to the Kings he scored a career-high 28 points (9-of-15 FG, 9-of-14 FT) while also dishing out nine assists and grabbing six rebounds. The five turnovers, the most in a game for Doncic since November 7 against the Jazz, shouldn't be a cause for too much concern given how productive he's been. Also standing out for the Mavericks was DeAndre Jordan, who matched his single-game season high with 23 rebounds to go along with eight points, three assists and three blocked shots. Jordan, who shot 4-of-7 from the field, surpassed the 20-rebound mark for the fourth time this season (he has two 19-rebound games as well). Entering the fourth quarter of Sunday's matchup of the teams with the top records in their respective conferences, Nuggets guard Jamal Murray scored a grand total of four points. The “Blue Arrow” had it rolling in the final stanza however, as he scored 15 points and Denver went on to beat Toronto by a 95-86 final score. Nikola Jokic led the way for the Nuggets with 26 points, nine rebounds, four assists and two steals, and backup point guard Monte Morris was productive off the bench with 12 points, four rebounds, four assists and two steals in 38 minutes. Murray's fourth-quarter resurgence helped Denver seal the win, but in the case of Monte Morris Sunday's effort was simply a continuation of what he's done for much of the season. The second year guard out of Iowa State is averaging 13.6 points, 4.8 assists, 3.6 rebounds, 2.0 steals and 2.4 three-pointers per game over his last five appearances, a stretch that includes a 20-point, six-rebound, five-assist effort in a win over the Grizzlies on December 10. Morris has been a quality bench contributor for the Nuggets this season, and at this point it may not be a bad idea to give him a look in deeper leagues. After scoring 28 points in his return to the lineup Friday against the Trail Blazers, Kawhi Leonard was even better Sunday night in Denver. Leonard scored 29 points (12-of-21 FG, 4-of-4 FT) and grabbed 14 rebounds while also tallying four assists and one three-pointer in 38 minutes. The versatile forward did his best to lead the shorthanded Raptors, who were without Kyle Lowry (thigh) Fred VanVleet (back), Pascal Siakam (back) and Jonas Valanciunas (thumb). But with only three players shooting 50% or better from the field (Leonard, Serge Ibaka and Delon Wright) on the night Toronto was unable to hold off Denver. The Nuggets also played without its full allotment of players, with Gary Harris (hip), Will Barton (hip/abdominal) and Paul Millsap (toe) all sidelined.